In the fall, I’ll be teaching my own course for the first time. In the past, my funding has been a healthy mixture of TAships (2 years) and fellowships (4 years). At Michigan, PhD Candidates who decide they would like to teach a course as part of their final year of funding are allowed to choose their own topic. Although my dissertation focuses on Mormon missionary work, I decided NOT to focus the course on Mormonism. I felt that doing so would define me too narrowly ? as a Mormon historian rather than a historian of religion, colonialism, and sexuality whose first project happens to focus on Mormonism. I also wanted to take a break from Mormon Studies. I also wanted, however, to teach a course that was related in some way to my dissertation and would challenge me methodologically. I eventually decided to teach a course called Religion, Magic, and Witchcraft that uses the tools of anthropology, history, and literary theory to think critically about the relationship between religion and magic. Why are some spiritual practices lauded? And others are demonized as witchcraft? How do we decide what belongs in one category and what belongs in the other? In what ways have ideas about race, gender, and class shaped what we deem to be acceptable religion? *Note: Many, if not most, of these come from Spellbound, Elizabeth Reis’ excellent edited collection on Witchcraft in the United States. My students will buying the book even though we won’t be using every essay. I am playing with different ways to organize the course. One idea I have had is to the Salem Witch Trials as an organizing theme. The course would begin with discussions of what constituted witchcraft in New England and then would use books like Seneca Possessed to understand how the reverberations of Salem for understandings of witchcraft among Native Americans, white settlers, and African Americans. Another way that I have considered organizing the course is around folk tales and myths about witchcraft. During the first few weeks of class, the students and I would read several fairy tales and would analyze them for what they tell us about how people of that time period that about magic, religion, and gender. As you can tell the course is still in the development phase and I would appreciate any insights that people have. I also wonder how others chose to focus on Mormon history or not. Did anyone else fear that teaching a course on Mormonism would define them too narrowly on the job market and would ultimately hinder rather than help their chances of getting a job? Great post, Amanda, and a wonderful class idea! I sympathize with your hesitancy to be defined too narrowly–an impulse that strongly influenced my job decision for the next two years. I imagine that while it may be a more immediate fear for those of us within the Mormon tradition (it is one thing to teach/research Mormonism, and another to do so as a Mormon), your feelings are quite valid. Especially in today’s market, where you don’t want any unnecessary hurdles. Thanks Amanda, these issues are particularly helpful to think about as I am just at the beginning of mapping out grad school. You might want to check out Tanya Luhrmann’s Persuasions of the Witch’s Craft: Ritual Magic in Contemporary England. I’ve already declared myself to be a Luhrmann fan – she comes at these issues from the perspective of an anthropologist. I have found her observations and insights (from another book)to be very helpful. This sounds like a fascinating class! As a younger graduate student, I have been encouraged to go as broad as possible if I want to study Mormonism in any capacity. As an aside, Durkheim is a must for religion/magic. There is a great book on And UVA has the transcriptions of the documents surrounding the Salem Witch Trials, including scanned originals. They may be valuable sources. I wish I could take the class, Amanda. I’ve read only a few of your readings. I like JZ Smith on religion/magic, and a massive fan of Owen Davies’ Popular Magic on cunning folk. Indispensable, really. I also thought Levack’s edited volume, Witchcraft, Healing, and Popular Diseases volume 6 in the New Perspectives on Witchcraft, Magic and Demonology series, was very useful. But talk about expensive! The courses I’ve taught have been evenly split (two on Mormonism, two on something else) for most of the same reasons you describe. Although I suspect my problem won’t be as much the focus on Mormonism, as it will be my eclectic, multi-national interdisciplinariness that tends to defy categorization. Oh well, we’ll see. Interesting. My capstone paper for my B.A. was about the transition from magic-based medicine in Europe to Greek-based medicine. I can’t recommend any good resources, but it was clear that among Anglo-Saxon Christians, the charms they performed were modeled off of pagan magic, but with invocations to Christian sources (God, Abraham, etc). Magic-based medicine didn’t decline because of religion, but because Greek-based medicine became fashionable in the universities and was slowly exported throughout Europe. I guess that once the educated doctors came around, people found that trusting a blessed rock would be better than bloodletting, which had the benefit of being a practice that you could easily see results from (even if those results probably caused more deaths than the blessed rock would have). People like to trust what they see. Thanks for sharing this, Amanda. Can you tell us a bit more about the course? What is the chronological scope? And if it goes into the 19th century, do you plan on incorporating Mormonism at all? If you want to understand Joseph’s story take a look at shamanism it explains the otherwise unexplainable. Thanks everyone for the suggestions. Chris, I’m not sure yet about what the scope of the course will be. The class is actually for the English department and so I am thinking it’s going to be focused on a few key moments. In my head right now, the course begins in New England with the Salem Witch Trials and questions about what constitutes magic and religion in that time period and then it moves to questions about indigeneity and religion. I’m not sure what the third unit will be, but my plan for the last one is to talk about the modern “revival” of witchcraft and its feminist implications. I also plan to use some of the works on the New Age appropriation of other cultures to critique it. All of that is subject to change. One thing that the program I am teaching through does is have students meet with a professor throughout the summer to develop their course and we haven’t had our first meeting yet. I probably won’t include Mormonism. My department recommends that people don’t teach their dissertations – and though not everyone follows it – I think it’s good advice. I wish I was an undergraduate again. I would so take this course! Have you thought about looking at how witches have been portrayed in popular culture? I know you are going to look at fairy tales, but what about expanding the popular imagery of witches and wizards? I was thinking about the Wizard of Oz (which you could contrast with Wicked), Witches of Eastwick, Practical Magic (great book, sucky movie), Hocus Pocus (one of the worse movies), Harry Potter (although that’s English), and American Horror Story, Coven. I also am thinking of modern literature, such as A Discovery of Witches trilogy (the last book comes out in July) where the main character is a witch and a historian (and it was written by Deb Harkness, a historian). Also, what about voodoo? I am assuming you will think about race in the class and its influence on how witchcraft and magic are defined. Looks fun, Amanda! I’ve love to do a class on the witch trials. Thanks, Cheryl! I’m torn about whether or not to include voodoo. I know so little about Louisiana or the Caribbean and I fear that in my inept hands it will become a caricature of what the students should know about voodoo. That said, the whole point of this course is for me to learn about ideas that I haven’t studied in depth but find interesting, so maybe I should include it! 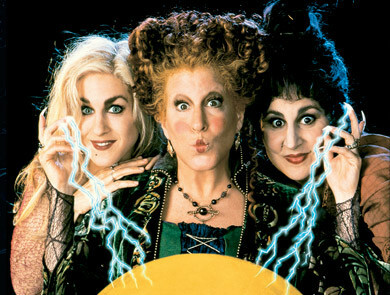 It makes me sad that you don’t like Hocus Pocus. I first saw that movie in the theaters as a kid and loved it. I have a soft spot for it still (my husband hates it though). Andrea, Thanks! I have been meaning to read the Witch of Blackbird Pond for ages. Can you tell me about midwifery and witchcraft? I actually wasn’t aware of the connection. While there is a rich folklore (including folk ritual), my understanding is that the midwife-witchcraft connection has been discredited. E.g., Harley, “Historians as Demonologists: The Myth of the Midwife-Witch,” Social History of Medicine. Jonathan – interesting… that might make an interesting set of the readings for the students. One of my undergraduate professors assigned two articles that were arguing with each other to help understand the way that historians think. Perhaps I could do a similar thing with midwifery and witchcraft. This sounds like a fantastic course! A year ago, I taught a course on “Colonial Witchcraft” and assigned Godbeer’s Escaping Salem – the students really loved it and I think it does a great job pulling apart some stereotypes of the witch hunts. Have you checked out Gretchen Adams’ The Specter of Salem: Remembering the Witch Trials in Nineteenth Century America? I don’t know if you’ll think its worth assigning, but this was how I managed to incorporate a week of Mormonism and other nineteenth century “fanatical” religions. (Her argument follows American views on the supernatural from Salem and examines the American disdain for Mormonism in much the same way as Spencer Fluhman’s Peculiar People.) Also, since it hasn’t been mentioned, I think Norton’s In the Devil’s Snare remains the best treatment of Salem, particularly in contextualizing how interactions with native peoples played into the story. Sounds like a great course! I like that you’re starting with Salem. A class I TAed started with fairy tales and the students had trouble getting on board – we “ruined” The Little Mermaid – but beginning by deconstructing fairy tales assumed a shared premise about reading cultural texts through a feminist lens that I think is easier to built up to. I have a 2-part lesson I do with my students that starts with a lecture on witchcraft belief in 17thC continental Europe and England. We look at all of these engravings of witches and witches’ sabbaths and read some of Martin Luther’s more lovely statements about female bodies and they start to see this connection between views of the female body (excess, devouring, desiring) and witchcraft belief – associations that carry forward into (wait for it) Ursula in The Little Mermaid! That’s more cultural history of the body stuff – different than English witchcraft belief that plays out at Salem, but it’s undoubtedly relevant and important culturally still today. Hehe – er, 16th century continental Europe, that is. Don’t tell. As a side note, I just read Willem de Blecourt’s “Cunning Women: From Healers to Fortune Tellers” in Curing and Insuring and he is pretty harsh on feminist readings that posit witches as healers. It might be another one to check out if you are going to do counter-readings.